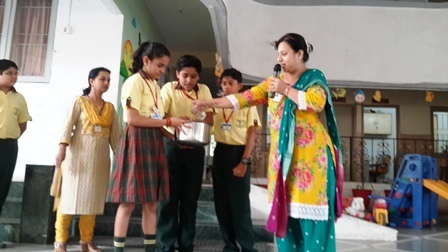 SWACHHAGRAHI ST. KABIR SCHOOL, NARANPURA BEGINS WITH A BANG………. Home → Exuberance Of Kabirians → SWACHHAGRAHI ST. KABIR SCHOOL, NARANPURA BEGINS WITH A BANG………. 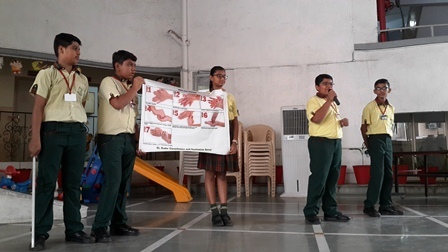 Under the Swachhagraha programme, we at St. Kabir School, Naranpura organized an assembly to promote Sanitation practices. It began with the teacher demonstrating the activity ‘Cleanest hands’ wherein students washed hands with water. The water collected thus was compared with clean and clear water. The students were awed to see such a lot of dissolved dirt in the water collected thus. 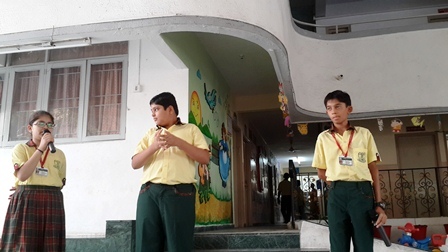 In order to educate the students regarding Sanitation and Healthy Lifestyle, Kabirians demonstrated and revised the importance of Sanitation followed by 7 steps of hand wash technique. The enthusiasm and eagerness of the students evidently conveyed that they had understood the importance of Sanitation and germ free life. They also promised to adapt the Sanitation practices themselves and to pass on the information to their family members and neighborhood also.